We have slowly been plugging away over here, and enjoying the milder weather compared to the bitterly cold February we just had. After the last post I pressure tested the hot and cold water lines to the shower, and found a small leak in the cold water supply, so I fixed that up and also installed the “drop ear” fitting for the shower head. I had to screw in a piece of 3/4″ plywood to mount the fitting onto, to get it set at the right depth for the finished wall. 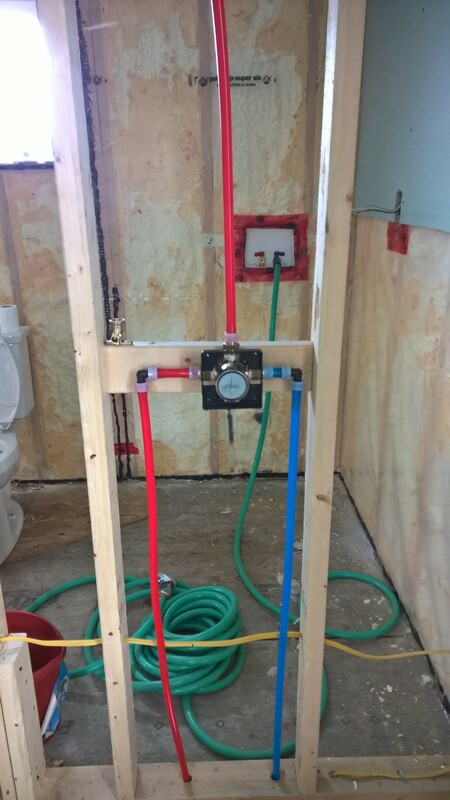 Shower rough-in complete and pressure tested. 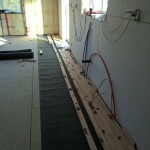 As regards to flooring, we had a really hard time deciding what type of flooring to use. The “best” kind of flooring to use over a radiant heat floor, is tile, but we found tile to be quite expensive and also it is a little hard on the feet. We also looked at cork, bamboo, laminate, and other engineered floors, but we used some of this in our previous house (kitchen remodel) and were not happy with it’s durability. 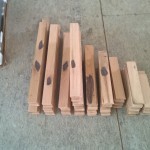 We finally ended up deciding to go with solid hardwood, but pricing for pre-finished hardwood is still quite expensive ($4/sq.ft. 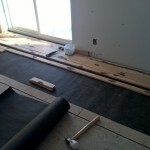 ), and we didn’t want to pay a premium for a floor we will probably wreck and need to refinish anyway. 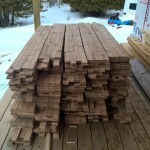 After doing some inquiring and research, we ended up special ordering some “cabin grade” red oak flooring at our local Home Hardware, which is an unfinished solid oak flooring, for only $2.80/sq.ft. The flooring comes from a sustainable tree farm up in Quebec and is basically their “factory seconds” so there are a lot of short boards and boards with some small defects, but it’s still a solid floor and no doubt will still look great when we finish it out. 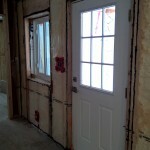 Our current plan is to finish the flooring in the living room/kitchen area, so we can finish the drywall in there and get the kitchen cabinets set up, then we can focus on completing the master bedroom to get that squared away. 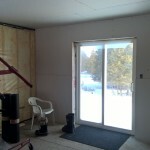 After that we will have to add a few more electrical outlets in the basement, and drywall down there (all the pink xps foam insulation needs to be covered), and we will be well on our way to getting our certificate of occupancy! 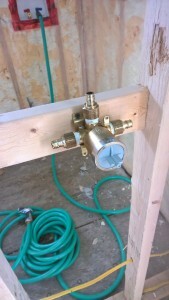 Step 1: Fasten your shower valve to some 2×4″ blocking in the wall, at a comfortable height. 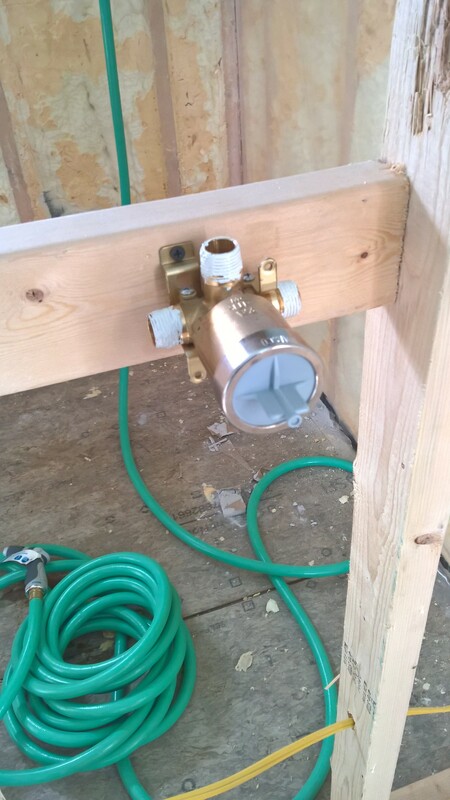 The instructions that come with the valve will tell you how far to set it back, to ensure that everything will be flush with the finished wall. 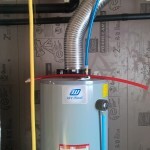 We used a Delta multi-choice/shower only valve. Step 2: Apply pipe dope to the male threads on the valve. 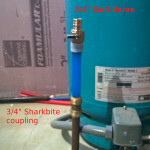 On this valve, because it’s a shower only, there are only three connections (hot & cold supply lines, and the showerhead). If you had a bathtub faucet there would be a fourth connection on the bottom. 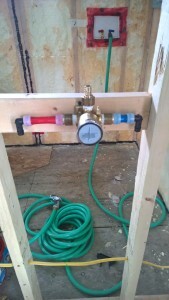 Step 3: Tighten the 1/2″ PEX to threaded fittings onto the connections that you just applied the pipe dope onto. 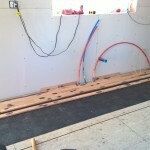 Step 4: Stub out a couple sections of PEX with 90 degree fittings. Convention with water is always, cold on the right, hot on the left. 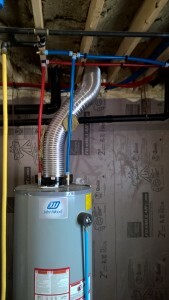 Step 5: Connect cold and hot water supply lines to the 90 degree fittings, and another line up for the shower head. 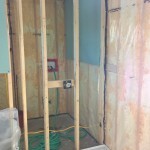 From here I have to pressure test the system to make sure there are no leaks, and finally attach one last fitting that the showerhead will screw into, and we’ll be ready to close in the walls completely! 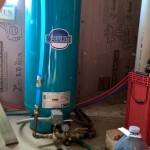 Hope you enjoyed the pictures, tomorrow will try to fire up the hot water heater and see what happens! 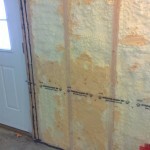 First off, let me apologize for the delay in making this post – it has, as usual, been a very busy time since we last posted, and we of course had some delays relating to the problems with the spray foam insulation that was used in our house. 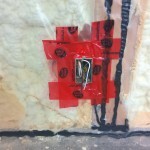 We ended up getting an independent engineers report on how to best resolve the issue with the insulation, they recommended applying a vapour barrier per Ontario Building Code standards, so we had to get that completed before we could start drywalling the exterior walls. 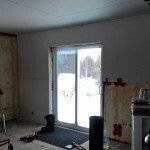 At this point, we have the vapour barrier applied, and correctly sealed with acoustical sealant, on all exterior walls except our master bedroom, and have been approved by our building inspector to continue installing that and then go ahead with the drywall. One of the issues we had to solve in applying the vapour barrier, was how to correctly seal around all the electrical boxes in those walls. 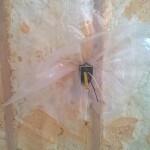 The building inspector recommended removing the boxes, wrapping them in plastic (same material used for the vapour barrier, 6mil poly sheeting), and sealing that to the vapour barrier. We tried this approach on a couple of boxes and it was pretty labour intensive to get it done right. 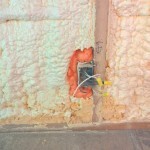 We ended up also speaking to the electrical inspector about this, and he recommended just digging out the spray foam from around the boxes, and spraying in “Great Stuff” canned spray foam, as that is a vapour barrier…we were happy that our building inspector accepted this alternate plan as it was a lot easier to do and did not require disturbing all the electrical boxes. 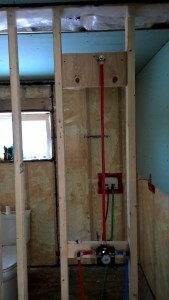 In the midst of all this, I started working on roughing in the shower in our master bath, but need a few more plumbing fittings before I can finish that off. 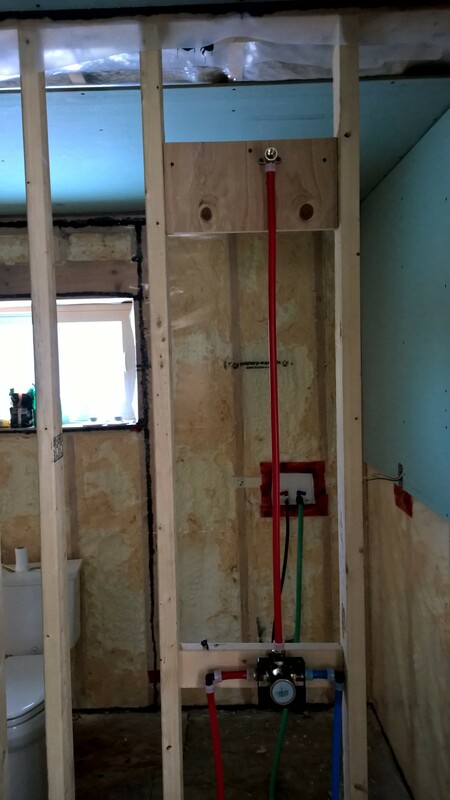 Also, I realized I needed to add another 2×4″ in one of the walls, to support the glass shower wall/door, so I will have to get that done before I can finish out those walls. 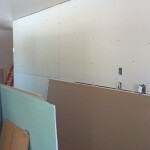 You’ll notice in the pictures, that the drywall in the bathroom is green – this is a special mold-resistant drywall intended for use in bathrooms. 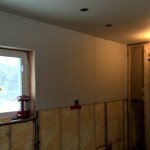 It’s about as easy to work with as regular drywall, just more expensive. 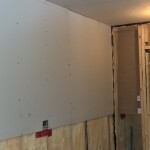 You’ll also notice that on the lower part of the wall in the master bathroom, we have used cement board instead of the mold resistant drywall. 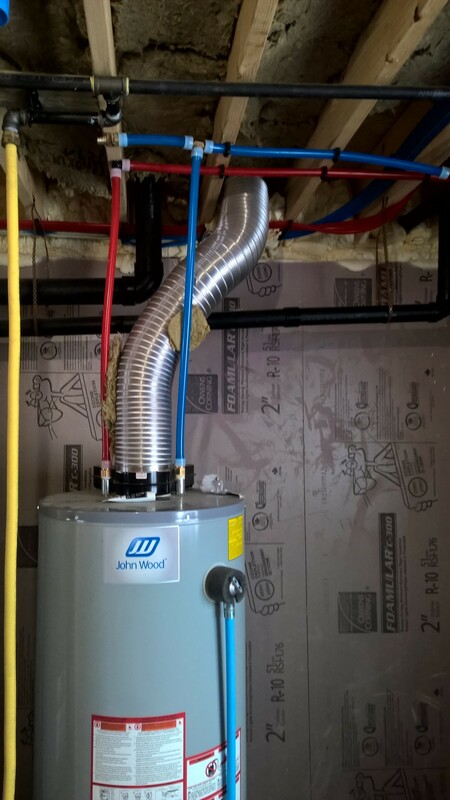 Cement board is just as it sounds – a 4×8′, 1/2″ sheet of reinforced cement. 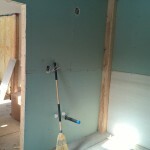 It’s really heavy compared to drywall and quite difficult to work with compared to drywall, but it’s what you are supposed to use if you plan on tiling the walls (we plan to tile behind the tub and the shower walls), as drywall cannot really support the extra weight of tiles. Finally, I plumbed up the main water line to the central water distribution manifold, and started connected the cold water to the hot water tank – but of course realized I needed a few more plumbing fittings to complete this job, so it’s on hold until I pick those up this week. 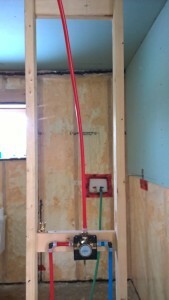 Transitioning from copper to PEX is readily accomplished with a “Sharkbite” coupling – no soldering required! 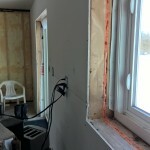 Mold resistant drywall and cement board, still have to drywall that plywood in the corner where our plumbing vent runs. 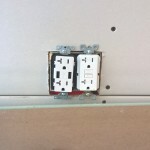 Kitchen counter outlets – two USB charging ports available! Thanks for reading, hope you enjoy the pictures, and we’ll make an effort to post more often! 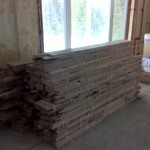 We are going to be ordering some unfinished hardwood flooring to put down, before we start installing the kitchen cabinets, hopefully we can get that underway soon.